Well I think everyone has heard the news already. How to Succeed in Business Without Really Trying received 8 nominations. Congratulations! Daniel himself wasn't so lucky this time: no nomination for his role on Broadway. I had been hoping he would be nominated. He deserves it. He workes so hard..
“It is disappointing if you’re not nominated, but it is such a strong year for musicals on Broadway and there are others who are very worthy of getting the nods,” he added. 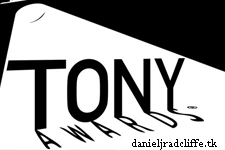 The Tony Awards air 12th June, 8/7c, on CBS.